Cross the Carpathians in the first map of In the Name of the Tsar. The Carpathian Mountains, 1915. Russian soldiers hold bitterly against advancing Austro-Hungarian forces. Against the rocky ravines of the treacherous Lupkow Pass, the vertical fights are as bitter as the cold. 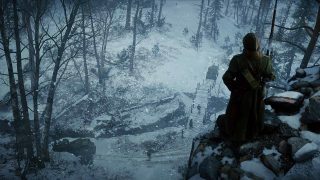 Use the all-new lance and evolved cavalry gameplay to ride with the Hussars along treacherous narrow passes, past the ruins of Rostov’s Hold, and to the snow-covered shelter of a small mountain village. On these frozen hills, there’s nothing so dangerous as the sound of approaching hoof beats. With constricted passes and gorges limiting your sightlines, adapting your tactics is crucial. Gain altitude and secure a vantage point on the advancing enemy to win the day – but beware that an Armored Train could turn the tides of battle at any moment. Based on Austria-Hungary’s attack on the Russian-held Carpathian passes, Lupkow Pass brings the war to a beautiful, but unforgiving, stretch of the mountain country during an abnormally brutal winter.